Ho-leh, did the sparks fly at this debate in Vancouver. 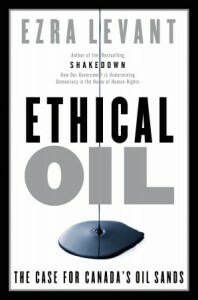 First, a little backstory: Ezra Levant, author of Ethical Oil: The Case for Canada’s Oil Sands, was originally scheduled to face off against Ben West of the Wilderness Committee over the premise of Levant’s book. And for most of the night, that’s just what they did. But then, at one point in that discussion, West decides to invite Gitz Crazyboy, an Indigenous youth worker and activist from Fort Chipewyan, AB, onto the stage to answer a question about the impact of Tar Sands development on First Nations people as he saw it. As you will see, Crazyboy’s take on that question didn’t go over too well with Levant. It’s in two parts. I think this is a good example of why you need to be tactical in your choice of words in debate. Avoid the word holocaust. There is no need when you have the word genocide. Just avoid the whole debate surrounding exclusive definitions of holocaust. Also, its generally a bad idea to go up against a professional pundit…. they are paid to be quick thinking, louder than you and to practice verbal judo. On the other hand, Levant’s harping against the race card was really just bizarre. I was totally caught off-guard by that much reactionary white privilege. It seems out of the ordinary to have a one-on-one debate suddenly morph into a one-on-two, which I gather irked Levant.In any case, it does seem neither side in that exchange spoke to the other’s point, namely, the matter of economic development (Levant) or the negative environmental effects (Crazyboy). Personally, I’d like to see this debate occur within the Aboriginal community, because, as Levant rightly points out, there are Aboriginally-owned economic interests benefiting financially from the Tar Sands, yet I rarely hear opponents address those interests specifically. Levant’s reaction to Gitz Crazyboy was asinine. Whether or not Crazyboy was in the wrong for using the term “holocaust” Ezra’s reaction was riddled by prejudicial, hateful, and outright insane rhetoric. The serious cracks in Levant’s “Ethical Oil” arguement were revealed. It showed how utterly out of touch he is with the real human concerns of the communities affected by the Tarsands development. I am ashamed and deeply concerned by the way he accused Gitz of playing the race card, while defensively screaming anti-semitism. Many anti-racist scholars, anti-genocide/holocaust and indigenous rights activists, as well as allies of persecuted and displaced people the world over would be rolling in their graves at the blatant disrespect Ezra Levant showed to Gitz Crazyboy. I heard Levant on CBC Radio trading one-to-one with Andrew Nikiforuk. He used many of the same tactics there – out shout, talk over, deflect the argument, deny well-known and easily confirmed facts by presenting fiction instead and hoping nobody noticed. Even someone as experienced to the rough and tumble of political and envirnmental debate/argument as Nikiforuk had trouble keeping up with Levant’s errors and distortions. As quickly as Nikiforuk tried to address one, Levant was crappingout another. I wouldn’t have thrown in an inexperienced person like Crazyboy against Levant. As for Harp’s musing about this debate taking place within the so-called “Aboriginal community”… Which one? Indian? Métis? Inuit? Limit it to the tar sands? Or broaden the debate to resource extraction anywhere and with any one of the three major groups – or all of them? And to what end? Is Harp suggesting that we debate penalizing those companies we dislike or can’t support? Perhaps boycotts of “Aboriginally-owned economic interests” (are they Indian or Métis companies? ), and by whom? Are we talking about debating the ethics of Nish’s exploiting other Nish’s? Undermining the Indigenous rights of other Nish’s? Or exploring whether it’s okay to exploit Nish’s if you’re a Métis-owned company? Sorry but it just makes my head spin. Isn’t this (tar sands) something that the Chipewyan of Northern AB and the NWT need to discuss and decide for themselves? If there is going to be opposition to it, it should come from those directly affected. If there’s a Cree- or Chipewyan-owned company exploiting their own people, and complicit in destroying the health of their own people, then it’s their responsibility to decide what they want done. If they accept the consequences, then what right do we have to intervene or interfere? Dan, for the Tar Sands specifically, I did in fact mean to suggest an internal debate, that is amongst those First Nations interests most immediately affected and/or involved within the region. And I agree with your statement, “if they accept the consequences, then what right do we have to intervene or interfere?” My basic point is that Indigenous opposition to the Tar Sands has always seemed to presume the pro-Oil Sands side is non-Indigenous-only. Clearly, it isn’t. I also hoped that such debate would place wherever resource extraction occurs and Metis / Inuit / First Nations interests are at stake, from whatever side of the issue they may approach it. Whoo-hee. Levant’s conduct makes my blood boil. Vile stuff, especially his quick and repeated cries of “shame on you”. This is what Bourdieu called “symbolic violence”, and it shows a complete lack of respect for Crazyboy as a person and for Indigenous people as such.I both agree and disagree with Alex; Crazyboy’s use of the word ‘holocaust’ did give Levant some added ammo that Crazyboy was not ready to deal with, but I don’t think there’s anything that Crazyboy could have done to prevent Levant’s rant. It seems that Levant was prepared for an opportunity like this and started getting all worked up as soon as Crazyboy made any reference to his own heritage. And Levant has the whole force neoliberal ideology behind him, as far his moral valorization of “jobs” goes and as far as this “race only exists if we mention it” thing goes. It’s not crazy per se; there’s a whole system of ethical claims behind the things he’s saying and the emotions he’s performing. That ideology is designed not just to out-argue its opponents but to silence them. This is something that a lot of activists on the left don’t fully get about the forces of the right; they don’t just think different things, they think by different rules.I do agree that it’s unfortunate that a local activist got pitted against a thug like this. I hope that West apologized to Crazyboy.I’d be curious to see what someone like Levant could accomplish if the debate had some rules requiring respectful communication – rules like no personal or ad hominem attacks, no shaming, that sort of thing. But I suspect someone of Levant’s disposition would refuse a debate that was framed in such terms, on ‘free speech’ grounds. Word to the wise: anyone who wants to describe Aboriginal experiences under colonization as genocidal or, especially, as a ‘Holocaust’ might want to read Ward Churchill’s essay “Lie for Lie” in “A Little Matter of Genocide” (City Lights, 1997) to have some idea of the kind of resistance they might encounter. (*)Basically, there is a tendency among some Jewish scholars to deny that the term ‘holocaust’, or in some cases even the term ‘genocide’, can legitimately be applied to *any* event other than the Nazi genocide of Jews, and that anyone who does so is a Holocaust denier. This gets applied as much to Gypsies who also suffered exterminatory violence under the Nazis, as is does to Aboriginal peoples of Turtle Island. (**)And not surprisingly, some thinkers (notably the late Emil Fackenheim) have explicitly linked this position to claims about the moral necessity of support for Israel as a specifically Jewish state.Please note that this position is not common to all Jewish persons by any means, or even to all Jewish persons who support the policies of the state of Israel. Among Jews, as among other ethnic communities, a wide and complex range of opinions can be found on questions relating to Jewish collective history.Like genocides of Aboriginal peoples, the Jewish Holocaust was both a profoundly traumatic event and one that continues to matter to contemporary political debates over the institutions of national self-determination. Anyone who wants to describe non-Jewish experiences as genocidal or, especially, as a Holocaust would be well-advised to factor in both the strong feelings and the powerful interests invested in the idea that Jewish experiences are historically unique. * To be fair, Churchill does distort the positions of some of the authors he cites as arguing for the uniqueness of the Jewish Holocaust. Some of those he cites as denying that Aboriginal experiences count as genocide were German historians arguing in a context where the colonization of Turtle Island was not being referred to. Their arguments logically imply denial of Aboriginal experiences of genocide, but that’s not the same thing as saying that they actively, intentionally engaged in such denial. However, there have been scholars who do engage in this denial – most conspicuously the American historian Steven T. Katz. ** The book “Is the Holocaust Unique? Perspectives on Comparative Genocide” edited by Alan S. Rosenbaum presents a range of different perspectives on the whole question of uniqueness. I agree, if a right-winger did the same thing to me and brought in a ringer I was unprepared for, I would be pissed off too. But I actually really like it when they go off and you get to understand what people really think and what their emotions are. It was good to know this guy is that much of a jerk and has no qualms about calling someone names, etc. His argument about Aboriginal economics wasn’t much different from that of Widdowson and Howard or Flanagan. To be honest its not much different from what is considered progressive (I’m thinking Jim Silver). It is all Jobs in one way or another. Absolutely no concept of political economic cultural revitalization. Which seems weird for anyone who understands Marxism. Levant just had a judge hit with a $25,000 fine for saying nasty distortions and outright lies about a provincial human rights commission lawyer. Unless Crazyboy is actually on the employee list of some “big, American, environmental lobby groups” (ya just gotta love that train wreck of adjectives), then – yes – it could very well be libel. I just thought the original statement a mite too broad. I wasn’t disagreeing with youse at all. I just wish that the folks up that way would pin donkey tails on any First Nation- or Métis-owned company complicit in this environmental outrage and public health disaster. Y’know, give ’em what fer just like those people are hammering BP in the Gulf of Mexico. Hit ’em where it hurts – in the stock exchange. In case you are not sure what Dan is referring to, the backstory to that $25,000 fine Levant was recently hit with can be found in this Nov. 19. 2010 National Post article. I just replied to another email – but about my reticence to link to a CBC story on this. I had no idea that the NatPost had one too.